This is a re-release of a recording which has held a place near the top selections for Monteverdi’s 1610 Vespers. It is good to see Harmonia Mundi has maintained its high standard of presentation with plenty of colour and verve, substantially chunky booklet text and all sung texts in Latin, English, French and German. 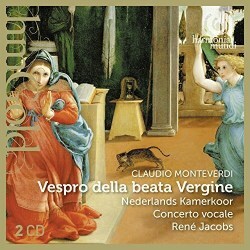 Trends have come and gone with regard to this work, and René Jacobs’ 1995 recording is seen as a revival of the more full-on all whistles and bells vision of the work, contrasting with the less opulent 1980s view personified in Andrew Parrott’s recording on Virgin Classics (see review). There is something to be said for most versions, and I still keep Robert King’s Hyperion recording (review) handy as a performance which seems to have the best of both worlds, with substantial choral size and The King’s Consort for grand instrumental support. Not everyone will warm to King’s crisply enthusiastic sound however, and if you like the substance of a full choir then this Harmonia Mundi recording provides the full works. Jacobs’ tempi are often a touch more reserved, which works well in something like the more intricate Laudate Pueri, but risks losing energy just a little in the opening Deus in adjutorium. This gives the impression of a stately procession rather than an overwhelming and imperiously statuesque monument in sound, and doesn’t quite lift off as I would like it for an all-time first choice. Musicianship is excellent, with the choral voices nicely spaced. The Antienne sections are suitably recessed into an ecclesiastical background, allowing the show-off soloists centre-stage – or rather, their own antiphonal spaces. Soloists are all allowed free rein to project with vibrato where appropriate, but there are no extremes or non-idiomatic outliers. The female duet of the Pulchra es is for instance delightfully sensitive, and that male-voiced Duo Seraphim is strikingly atmospheric. Choral sound is also coloured with vibrato at crucial moments, but clarity is maintained throughout. The textures of the Nisi Dominus are suitably rich, though keenly observed articulation amongst the choral singers makes for a performance with plenty of energy. Echo effects are nicely done, and the far-off instruments of the Ave Maris Stella create a magical effect. A very minor point, but the last two numbers of the Vespers leak over onto CD 2 where if they had been included on CD 1 I make the total timing at just over 80 minutes which is by no means unheard of these days. Another very minor point, but while we are looking at CD 2 I would suggest those recurring vocal lines in the final Sancta Maria pro nobis might have been a trifle less diffuse against those busy instruments. This recording is filled out with superbly sung Magnificat which leaves time for other extras, but with a performance this good there can be few complaints. Don’t underestimate the Magnificat as it contains some of the best music – just listen to those beautiful recorders towards the end of the Quia respexit, or those stunning echo effects in the Deposuit. At its re-release price point this highly refined and deeply involving recording now has to be considered a real bargain.